The age of the clamshell phone is long gone, but Samsung has some new foldable smartphones and displays in the works, some of which will debut at MWC in a closed-door event. This information will be used to gauge interest in the technology from both consumers and other handset makers. Samsung recently announced the launch of a device with a foldable display, saying that the phone could be available for purchase as early as Q4 2017. Reports say that Samsung Electronics and Samsung Display are collaborating on a project that will demo foldable smartphones and flexible AMOLED displays for a “select audience” at MWC 2017. This audience will be able to provide feedback which Samsung will use to gauge demand for such a device, but unfortunately the public will not be able to have access to this closed-door event. Samsung is not just looking to show off its technology to influential consumers at MWC, however. Other handset vendors will undoubtedly be curious as to how Samsung has executed their design, and Samsung would like to get an idea of what kind of price they’d be willing to pay for it. Several major smartphone makers filed patents for foldable devices in recent months, but thus far no other companies have said they are bringing a prototype to MWC. 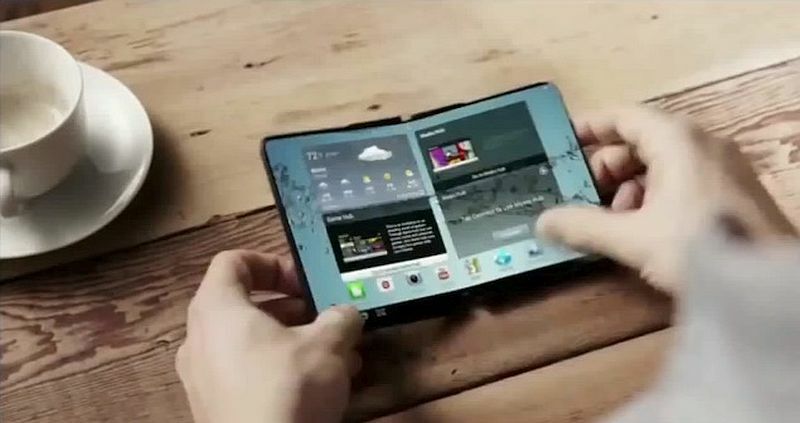 Samsung’s current potential competitors who also may have foldable smartphones in the works include Microsoft, LG, and Apple, who’ve already filed patents for similar foldable concepts.